Another month done and dusted! (I think I better start checking for new grey hairs, time is passing so quickly!) This past month has been a busy one for me between my long awaited Naturopath appointment; the new regime to help me on the road to gut & digestion healing; planning our trip to India which is approaching at light speed; getting up to speed for voting on the presidential election and uglifying myself for our annual Halloween dance. I honestly can’t believe that November is upon us and the stores and television are already filling ever corner with Christmas! So before I completely loose sense of time, let’s take a little look back at all the food allergy friendly and not so friendly happenings this last month... Also, see the end of the post for my gruesome Voodoo Witch costume (Halloween 2011)! ...and beware because the following pictures actually turn MY stomach (!!) and I'm the one whose responsible for them (I did the makeup myself and F. took the pictures for me)... Some people didn't recognize me at all under all the makeup, which I thought strange, but even my family struggled to see the 'me' in the pictures and it actually comes as a bit of a relief I must say! ;) ...have a spooktacular night! It's that time of the month again for 'What I'm Reading'. This month I have been looking for steamy hot soup recipes and I've been thinking about the difference between food allergies vs. intolerances and all the 'stuff' that goes with it. Oh, I've also been daydreaming about a ski trip to the French Alps with an allergy aware kitchen in a sweet chalet...mmmmm! And lest we forget some top notch food photography because I always need a bit of food eye candy to get me though the day. The nourishing Gourmet: Q & A: What Nutrients Am I Missing on a Dairy Free Diet? Safe Food: can you be allergic or intolerant to more than one food? You can make your own mind up about the sweetener and if it suits your sugar free diet or not. A while ago I posted a cross-reference guide to Dairy Free butters/ margarines available in Dublin/Ireland. 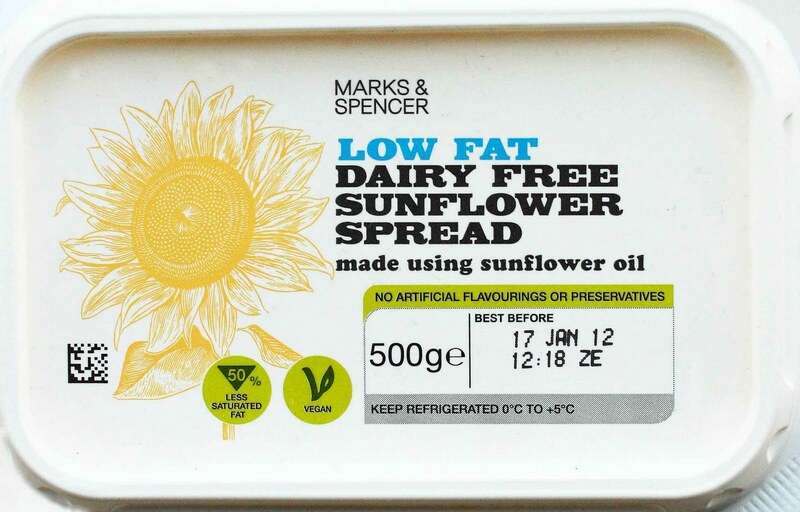 I received a great comment telling me about a top notch Dairy Free and Soya Free margarine that I left out from Marks and Spencers. I had never tried nor seen this margarine before but promised excitedly and solemnly to try it out . Well, my commenter couldn’t be more right! 1st I would like to thank any commenter for allergy free tips in Dublin, greater Ireland and/or abroad! Thank You! I love your comments and rest assured that all of your suggestions, tips and reviews are stored safely away on one of many, but not forgotten, to-do lists! 2nd, Yes! M&S trumps again. I still like the Pure Sunflower spread but that by no means knocks Marks and Sparks’ contribution off the chart - well done! 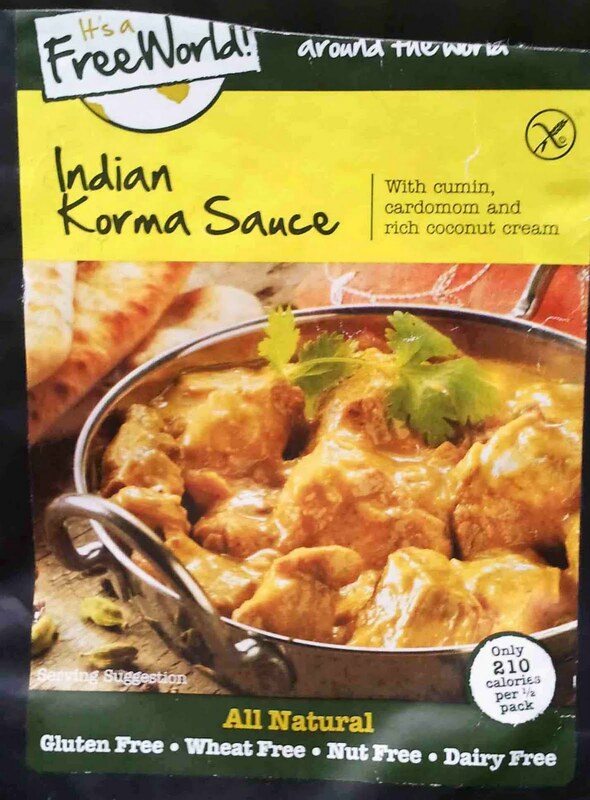 It’s creamy, it’s smooth, it doesn’t have some of the ‘usual suspect’ substitute flavours and it even seems to melt a tiny bit better if you pop some into your boiling pot of pasta while its cooking and best of all, it’s not expensive! At less than €2 it is a true rival to Pure. I have, of course, updated my original post and would like to invite everyone and anyone to share any allergy free/friendly product that you have unearthed, love, hate or are curious to try, whatever your allergy or it’s free from attribute. The sad truth of the food allergic world is that: ‘All which is gold does not glitter.’ No doubt, things are getting better. There is an increasing amount of competition in the Free-From food market which is pushing producers to make Substitute and Allergy Free foods to higher and higher standards. We the Free From & Food Allergic population won’t just eat anything anymore! ... But the hard part is in the, not always tasty and exciting ordeal of trying all the different products on the market to weed the good and the amazing from the mediocre and the tragic. Anyway, the whole point of today’s post is to tell you about a less than amazing Dairy Free hot chocolate experience. One day, quite some time ago, My lovely friend S. gave me a very tasty looking jar of Ballyshiel Speciality Vanilla Hot Chocolate single cup drinking chocolate drops to be enjoyed during one of our many DVD nights which started out as a tribute to musicals but has since moved into a Period Drama 101 course. The hot chocolate (new to all of us) looked fabulously lux and just so happened to be Dairy Free but I just so happened to be out of Dairy Free milk ... so ... after a few dvd nights I finally got my act together and re-gifted the hot chocolate drops back to S. with an accompanying carton of Dairy Free Provamel Soya milk. I was quite excited to try this Dairy Free Hot Chocolate out and extra excited because S. her husband T. and our Musical and Period Drama partner in crime G. were all going to have their hot chocolate a la Dairy Free with me, despite their cow milk drinking lifestyles of choice. Ohhhh, the woes of the food allergic. Is there ANYthing worse then sharing allergy free food (especially sweets) with non allergics only to the horror of it tasting rubbish? We all quietly sipped our hot -supposed to be- chocolate until finally T. broke the silence by announcing that really it just tasted like hot Soya milk and we had to admit that it was true. Where was the chocolate? Where was the sweetness? G. finished his because warm soya milk isn’t so bad but What. A. Let Down ... and after such a long wait! The moral of this story: if Ballyshiel hot chocolate drops are loved by many (which I doubt), they are definitely not suitable for dairy free substitutions ... or maybe that 50% water just really rocks the chocolatey goodness, I will never know because I will never try them again. That’s right, it was THAT disappointing. Just a quick little note today because I heard that Natasha from Natasha’s Living Food is giving a **FREE** talk on Thursday, October 20th (that’s tomorrow). 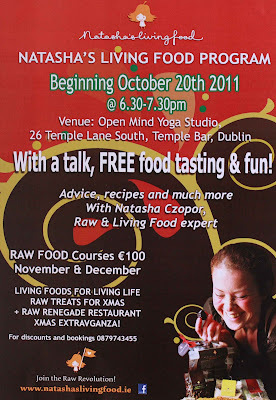 It’s part of the Natasha’s Living Food Program and is promoting the Raw dietary lifestyle and Raw food courses in November and December. There will also be free food tasting with recipes! I won’t be able to make it myself but if I could I Definitely would go along. 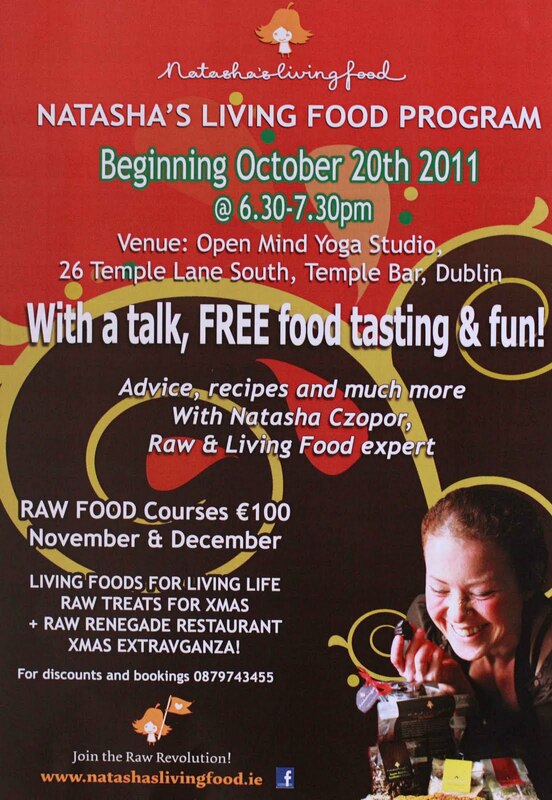 I’m not a raw foodist, as I’m sure you know, but I would definitely jump at the chance of a free talk with super tasty samples to bite on and the added bonus of a recipe or two which, as you know, will be Vegetarian, Vegan, Dairy Free, Wheat Free, Gluten Free, Egg Free, and Free of Refined Sugar too! And if you do go, which I hope, please tell us all about it! New on the Block is Yamamori’s fourth Dublin venture, the ‘Oriental Cafe’. New restaurants are always a hit in our small capital city and especially one born from the popular Yamamori Allergy Friendly clan (Yamamori Noodles, Yamamori Sushi Bar and Uikiyo Bar. So understandably, I took my first opportunity to try it out. 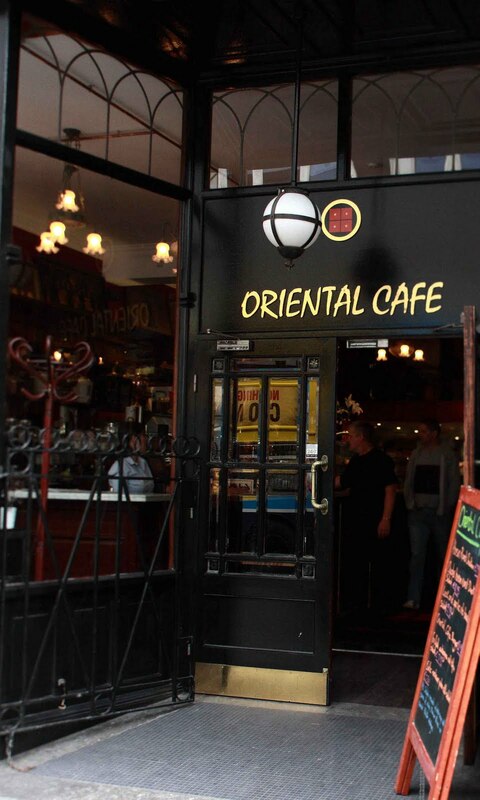 The Oriental Cafe is a new venue and still working out some teething issues such as over ensuring the table service, which we won’t hold against them! The idea is to serve only starters and side orders along with Asian beers, wines and sake, creating a light social atmosphere (with a DJ) into the night as opposed to a formal restaurant affair. On this element I think our party were very pleased, and likewise, when I asked for further food allergy advice on the menu beyond the already labelled Coeliac and Vegetarian options, I was very impressed. I explained that I was Dairy Free and the waitress (who assumed that Dairy Free included both Milk and Eggs, which suited me) conversed with the kitchen and showed me what was off limits before I got my hopes up. Turns out that the entire menu is free from both Milk and Eggs except the Oriental Pork Buns, New Style Pecking Duck, Pork Belly Congee, Roast Duck & Duck Egg Congee and the sweet potato wedges (which are served with mayonnaise, hence them not being egg free). After a full and easily navigated menu I could happily relax and enjoy the anticipation for my soon to arrive meal. and after that everything was fairly mediocre. F. had a green bean spicy salad and some type of fried aubergine, both acceptable but not amazing. S. had a salad which was colourful but failed to wow. and T. and myself both made the unfortunate mistake of thinking that the Congees, which make up almost a third of the menu, were misrepresented as a ‘rice porridge’ because that is exactly what they are. 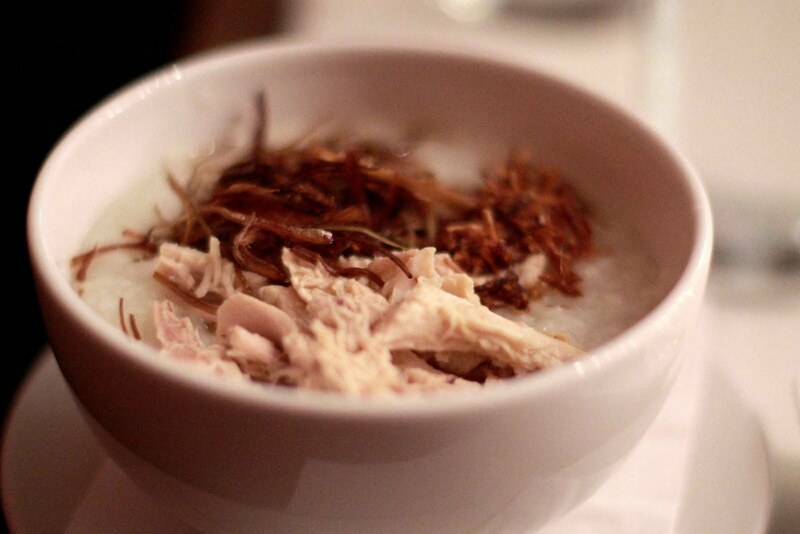 Bland and mushy, and extremely similar to porridge, we were probably the most disappointed. We both ended up pouring in some of the dipping sauces from the dumplings, etc. just to add a small amount of flavour. Salt or Soya Sauce on the table would have been appreciated. There were some other dishes at our table, like chicken wings and sweet potato wedges but the overall evening failed to impress our culinary palates. Verdict: The decor was nice and I love the street window chefs, which would always capture my good word. If you or your friends want to try it out rest assured that the menu is food allergy friendly with Coeliac/Gluten Free markings as well as Vegetarian. Vegan is a definite possibility and with advice from your server Dairy Free and Egg Free are not a problem but by the end of our meal we all agreed that within a few months we wouldn’t be surprised if the menu has been changed/updated. One word of warning: I would be apprehensive of eating here if I was severely allergic to fish as vegetarian F. pointed out that the sweet potato wedges, although tasty, were slightly ‘fishy’ so they are most likely suffering from some deep frying cross-contamination. 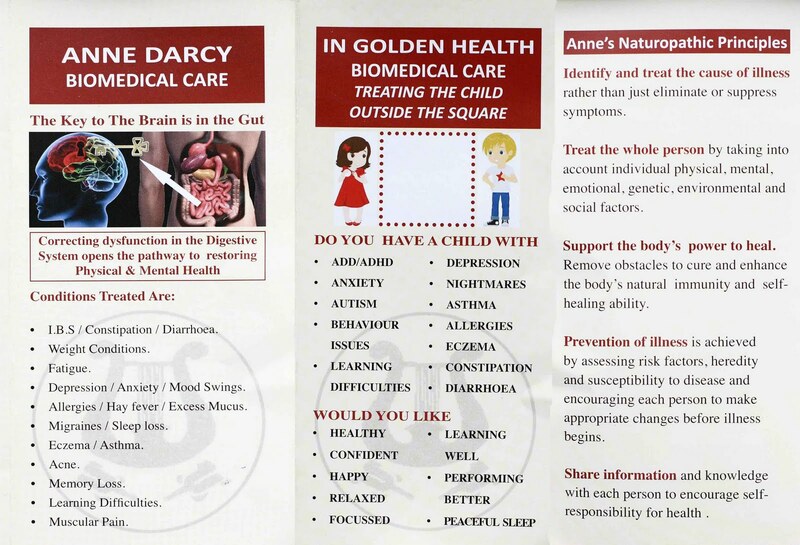 Last Wednesday I went to see a Naturopath, Anne Darcy, who specializes in Biomedical Care for children. I had heard that she also treats adults, has an amazing fountain of information and focusses on digestive system and gut healing. I was prompted to make this appointment because no matter how many foods I seem to remove from my diet, and no matter how long I stay off of them, every time I reintroduce something my system, which is only balancing day by day, goes bizerk. I made a list of all my ‘symptoms’ ranging from the obvious (ie: bloating, stomach cramps, head rushes, headaches, water retention) to the seemingly ridiculous and random (ie: sensitivity to loud noise, easily frightened, itchy legs, high tension dreams, tendency towards compulsive behaviour, to name but a few). Once I got going at making the list I ended up with so many potential ‘symptoms’ that I was apprehensive of presenting them. I felt like a complete hypochondriac. On top of that my mom insisted that I write ‘excitable’ as well. I had been fighting the term ‘excitable’ and ‘nervous’ for years but seeing as I was trying to be completely honest I put it down ... ugh. Anne Darcy was/is my last hope. I had the full list of food allergens and followed it to a T but somehow things just weren’t getting completely better ... yes, partly better but never completely and nothing ever changed my random problems like noise sensitivity and high tension dreams (every single night btw) ... and what was the response to my long list of grievances you ask? The solution is a few prescribed supplements and time. I am to return for a second appointment in one month but since I’ll be in India I will go on my return. All with specific dosages at specified times of the day. I also have to pick up one more supplement (Nature Plus: Candida Forte) in Health Matters, which I will do today. This amount of supplements also make me feel like a hypochondriac but you gotta do what you gotta do. 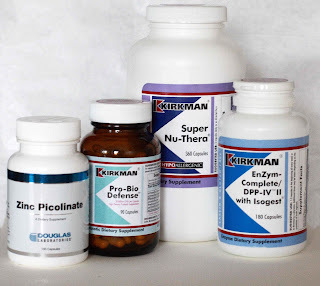 So far I have had a pounding headache since Wednesday and after my first heavy duty zinc I had major queasiness and the desire to throw up (interestingly I had often thought I had a deficiency in zinc but every time I start taking it I felt sick so I always stopped ... but not this time!) I accept, understand and am not too surprised by most of the diagnosis but its the ‘conditions’ (esp. the Retained Moro Reflex) that have thrown me for a loop. For more on Pyroluria see www.primalbody-primalmind.com But just for the record, I am not schizophrenic (lol!) and my 2nd toe is not longer than the 1st, which is a common sign. Moro Reflex is the ‘fight/flight’ reaction in babies. It is natural and healthy in babies but should be replaced by 3-6months with the adult ‘startle’ reflex. 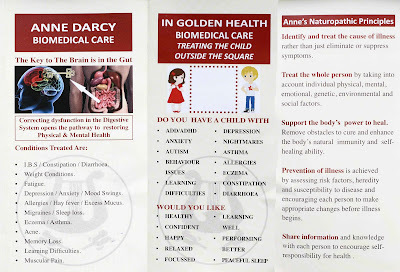 If it persists in the older child or adult it over stimulates the adrenal glands, creating too much adrenalin and cortisol which cause fatigue over extended periods that break down the immune system and can lead to chronic illness and allergies. Well, that's about it... and fingers crosse that it all gets better soon and that this headache goes away even sooner! 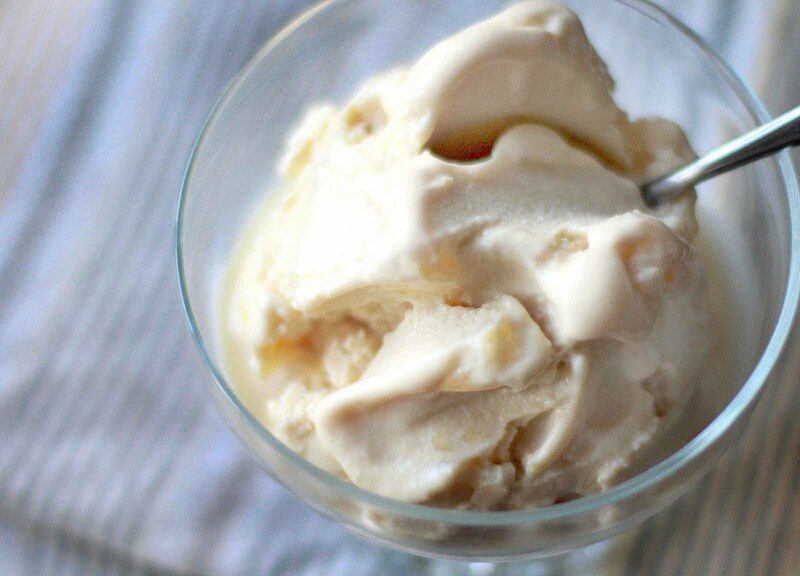 If you are Dairy Free, Egg Free, Gluten Free, Vegan, Sugar Free, Corn Free, Nut Free ... basically, what I’m trying to say is that if you have any type of food allergy which hinders your enjoyment of the simple pleasure that is ice cream just break the mold and buy yourself an ice cream maker. Yes, it is possible to buy allergy-free ice cream and yes, some of it tastes really good but very little can compare to the real deal homemade iced cream from the gods...and sorbets too! 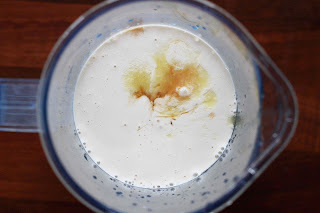 - Making Ice Cream in a machine is one of the easiest, fastest homemade free from desserts you are likely to find, and if you keep the machine permanently stored in your freezer, fresh free from ice cream is never more then 60 minutes away! And if you're worried about all the extra pounds you will put on from eating bowl after bowl of allergy free ice cream fear not because I promise that once you get the knack of it even your cow drinking friends and family will love you more because you will now be the provider of sweet soft and beautiful ice cream and it will swiftly disappear before you can over indulge for they will neither know nor care if it doesn’t have ‘real’ milk or that it just so happens to NOT contain any gluten or wheat or eggs or even sugar like the recipe below!! 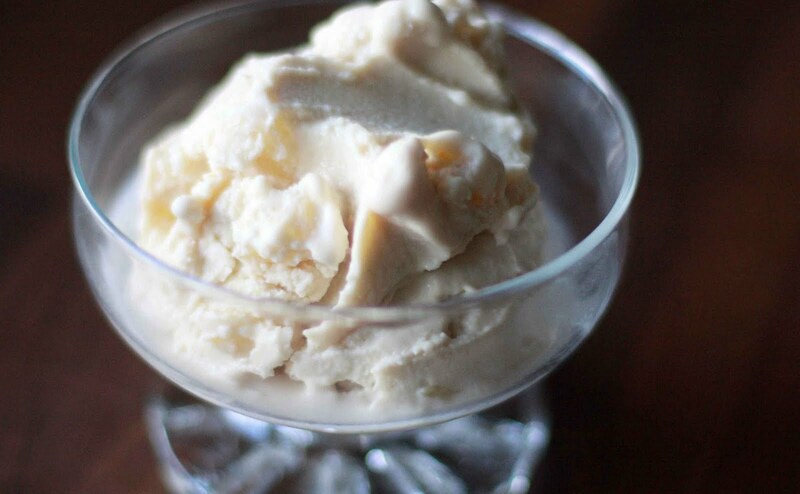 All your guests will know is that they are eating some seriously nice ice cream! A smooth, gently sweetened and gently flavoured soya based ice cream for any occassion! 1. Measure out 8oz of the Pineapple, equal parts of both chunks and juice (retain the remaining pieces for step 5). 2. Purée the pineapple pieces and juice until smooth (I used a hand-held blender). 3. 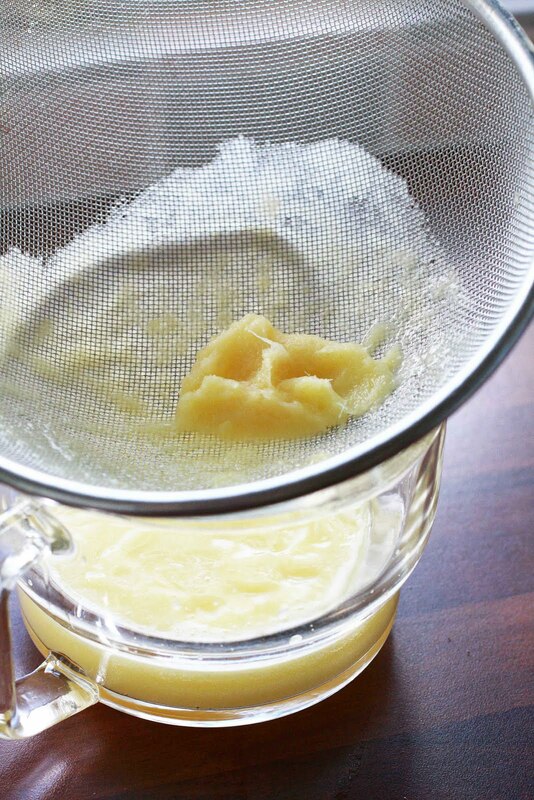 Strain out the stringy pulp by pressing the mixture through a sieve with a spoon. Discard the left over stringy pulp. 4. Mix the Pineapple Purée with the Soya Cream, Agave Nectar and Vanilla Extract. Blend thoroughly (again, I used the hand-held blender). 5. 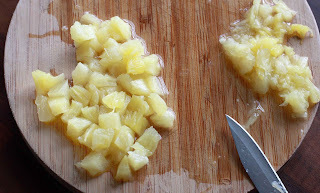 Chop the remaining chunks of pineapple into small cubes, discarding any pieces which don’t hold their shape. Stir into the cream mixture. 6. Chill the mixture in the fridge thoroughly (I put it in the freezer for about 15 minutes before moving it to the fridge to speed up the process). 7. And follow the instructions for your machine. If you just glance at the above directions you will think that there is a lot involved but seriously the problem is that I am way long-winded so just get straight to the making, you’ll have ice cream in 35 minutes tops! Good morning and good day! 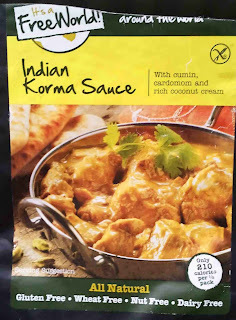 My mom found this little All Natural packet of instant Indian korma sauce in Portlaoise in Tesco so it should be hiding around some corner in other cities, such as perhaps Dublin?? Anway, she said that it was really quite nice and as you can see it has a healthy list of 'Free From' attributes... Nut Free being the highlight because it's so hard to get foods to list themselves as Nut Free! Ingredients: Water, Onion, Creamed Coconut (15%), Tomato Purée, Sugar, Cornflour, Lemon Juice, Garlic, Coriander, Olive Oil, Cumin, Ground Coriander, Tumeric (<2%), Sea Salt, Cinnamon, Paprika, Ground Cloves, Chili Powder. 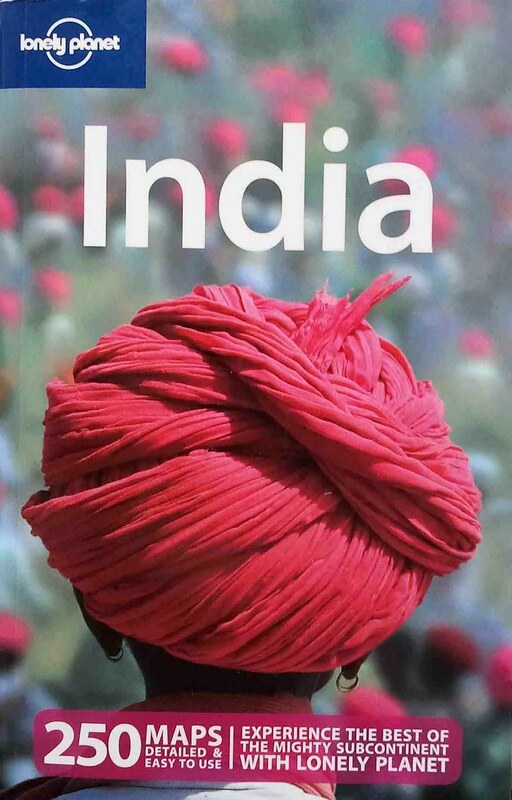 I have been struggling to arrange the finer details of mine and F’s fast approaching trip to India... we’re leaving in about 3 weeks! Apart from getting the visa (which I have to try for a third time today - it seems that oct 6th was Divali so the office was closed, on the following day I was turned away because they don’t take cash, cheques or cards... only postal orders. They also don’t take originals of proof of address, etc, so fingers crossed for today! But seriously, it can’t be worse then the girl in front of me in the queue travelling at 1pm that day who didn’t know she needed a visa. If you find yourself in this position it would seem that 3pm is the earliest ‘same day’ service that visas can be produced because somebody has to come from Cork to sign it!... All of our hearts went out to her as she went home to change her flight). Soooo, I have been so excited but also dreading this coming trip. We’re only going for a few weeks but the food is going to be a nightmare! - Ghee is an Indian staple. If you’re Dairy Free or have any type of intolerance or allergy to dairy/milk you will probably know that ghee is generally clarified butter and is heavily used throughout India. - Problematic for Dairy Free kids like me will be our planned trip to Vrindavin which is a major pilgrimage city and especially important for the Hare Krishna population so there will be a lot of Hare Krishna type food which is both Vegetarian and Egg Free but sadly often milk rich. F. tells me that Hare Krishna’s believe milk ‘helps develop the final brain cells which help to understand spiritual knowledge’ thus the large pro-milk diet. - Also in Rajasthan, they often use camel milk (?!). Although I have an allergy to cow’s milk I seem to be only mildly intolerant to goat’s milk and sheep’s milk (ewe) so maybe camel milk will be my saving grace? They even make ice cream out of camel milk! - If you are vegetarian you will be smooooth sailing as a huge percentage of Indians are vegetarian and vegetarian food is available most everywhere. In Gujarat 90% of the population is vegetarian! - If you are Egg allergic or just Egg Free (which I am trying to be) then keep an eye out for the vegetarian meals especially in Vrindavin where egg if usually/often/sometimes considered as anti-vegetarian so all the vegetarian dishes will be naturally free from egg. - Dosas! Which are naturally Wheat Free and Gluten Free (with exception of Rava Dosa which is made with Semolina). Dosas are large crispy pancakes made from rice flour or mung-bean dahl. They are usually a breakfast food and Masala Dosas come with spicy potatoes inside. They often have onions but not usually tomatoes, if you happen to be Tomato Free and having a hard time. This is actually a good fall back if you are in an Indian restaurant such as Madina on Mary St, Dublin 1 where the Masala Dosa is the only Ghee Free Dairy Free dish available. Finally I would like to apologize to anyone who was reading my blog over the weekend and had to witness the 500 changes to the template and background and colours and fonts...zeesh. I was trying to organize it privately (a.k.a not online) and was oh so happy with friday’s grey and red theme. I thought it was cool and sleek but it seems that I was wrong. Almost EVERYbody missed the lemons. Some said that it was nice but in general everybody thought that it was ‘sooo grey’.. ‘it’s just sooooo grey’.... right.. ok, point taken. So we want the lemons to return. I tried that but to no avail. I liked the lemons too but there was just something about them and the way they worked with the overall layout that annoyed me every time I logged on and we can’t have that! etc, etc.. I put each one online so my sister who lives in Kilkenny could judge them... So like I said, Super Sorry to any readers who witnessed that! In the end, Tah-DAH! It's bright yellow wheat. 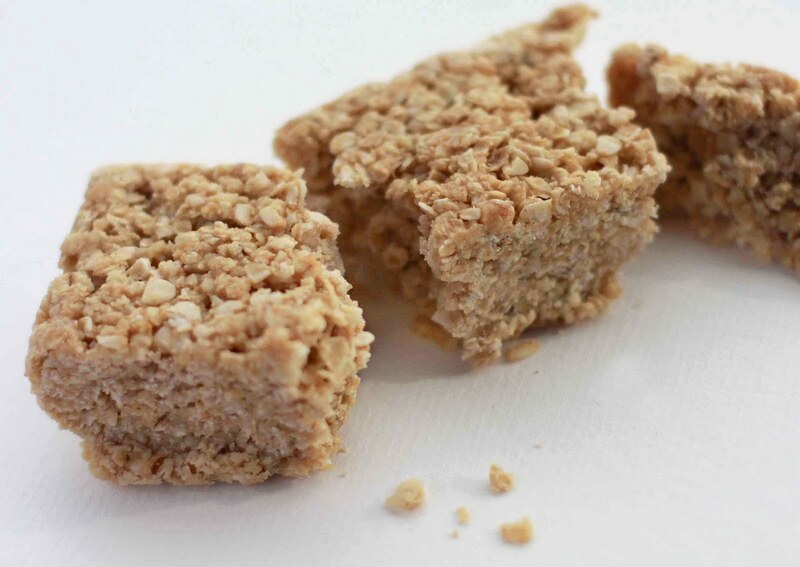 Yes, wheat, one of the big food allergies... but what do you think? Yea or nay? I also like that it somehow reminds me of bumble bees.... and looks happy but also healthy and wholefood-ish. I would really love your opinion, positive or negative as it may be! Art Gallery Sales Assistant and aspiring Studio Jeweller. 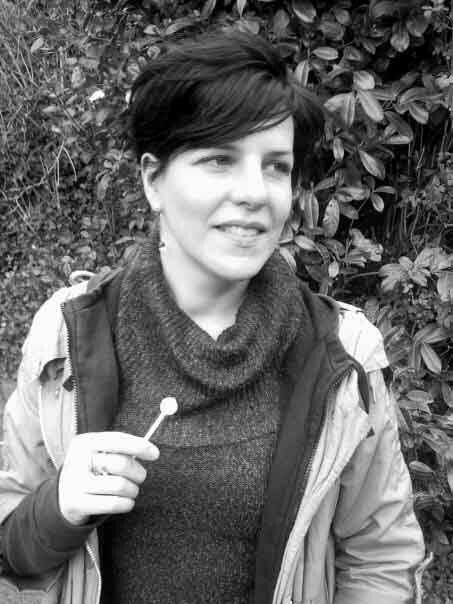 Catherine is in her mid-thirties and lives in Dublin. She has a massive collection of sugar packets (1100 strong) and has been practicing yoga for the last five years. She is a huge advocate of walking be it hills, fields, cityscapes or cross country, literally, having crossed both Spain and Portugal on the Camino Frances and Camino Portuguese, respectively (without straying too far from her food allergy diet!) She also does watercolour paintings and simply can’t resist a wind-up toy. I am allergic to Milk and have a sensitivity to Eggs and Oats. 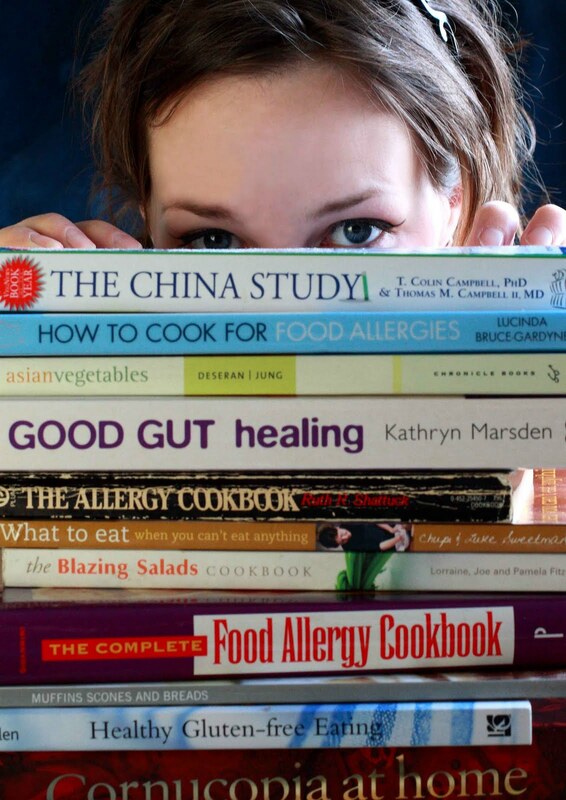 How long have you had, or have known about your food allergies/intolerances? I've known about my milk allergy for 20 years, Eggs I think I've known about since childhood and oats about one year. A rotation/elimination diet my mother put me on when I was a teenager uncovered my milk allergy. She was into health food and decided that my bloated belly, sluggish nature and bad morning breath could be allergy symptoms. The eggs were quite obvious, I think I realized the connection quite young that if I ate more then one a day for about five days running I would get hives. Oats I have only discovered in the last year or so. Every time I start to eat porridge as a healthy breakfast alternative my digestion would get very sluggish and I'd put on about five pounds that I just couldn't move, no matter how much I exercised and cut back on fats. Those pounds magically disappear when I quit eating porridge so there is a problem there. I gave up gluten for a while just in case there was a connection but that doesn't seem to be it, only oats cause the symptoms! Generally these days I have little trouble sticking to my diet. At first though it was very difficult. Being a teenager I just wanted to do everything my friends did and be 'normal'. There weren't very many substitutes like soya/rice milk, cheese and yogurt on the market then. Putting apple juice on your breakfast cereal was what the books recommended back then... truly disgusting! Food allergies also weren't widely known about. People acted as though you were just making a fuss about yourself and that if it really was an issue that you should be able to get some sort of shot from your doctor like an antihistamine for hay fever. As time passes you get pretty savvy about reading ingredient labels and asking the right questions when eating out so you don't stand out too much. Food is really such a social thing and you never really think about it until you can't participate. It is also really awkward when eating at other peoples homes. The last thing anyone wants to do is offend your host by not eating what is offered to you. Can a spice count? I'd hate to eat most things if paprika was out of bounds! Other then that my favorite healthy food is puy lentils and I have a true weakness for plain salted crisps! Both my sister and mother have food allergies so we are all pretty tolerant of each other in trying to cook without the offending food and understanding when we feel rotten because we've accidentally eaten something wrong. A lot of my extended family generally prefers to believe it's all in my head (personally I think this is because they are afraid they may be allergic too). Any of my close friends have always been supportive, often to the point that they embarrassingly screen food for me when we are out! Many of them have actually tried a dairy free diet to see if any of their own little problems like bad skin or runny noses might clear up. Where is your favorite place to eat (that can cater to your needs)? Yamamori on the quays near Ha'penny bridge. Japanese restaurants are always great, I can eat just about everything on the menu. Asian cuisine in general is pretty dairy free. If so, why? How does it feel? & How long does it take to get back on track? When I travel it is hard to get what you need, especially if there is a language barrier! It also can be very hard to pass up a little taste of a local specialty you know you will never come across again! But even then I try to wait until the last few days so I won't be feeling crap for my whole holiday. When I first gave up dairy products it included a lot of my comfort foods like cheese cake, skor bars and cappuccinos. The cravings for these often lead me to breaking my diet. But I suppose with time, waking up with sore arms and legs and feeling all doom and gloom eventually outweighed the momentary comfort/ pleasure. When I do accidentally get dairy these days it takes me about a week to get it all out of my system. I am pretty good at getting back on track right away even though when I get a trace of milk the cravings come back. Actually if I find myself longing for pastries or a slice of pizza it's a sure sign that there's been an unnoticed slip up somewhere! Really and sincerely try giving up your allergen for at least a month (it often takes at least a week to clear your system alone). I have met far too many people who've only gone off their suspected problem food half heartedly ie: If you are giving up dairy that includes cheese... Yes, I know you love it too much to give it up... but try. It just might be worth it! There is an amazing amount of info and recipes on the internet which have been most helpful over the years but really I have to say that the allergy advice labelling that has been introduced on food products has been a huge help: One, for speeding up shopping time and Two, for solving the contents of ambiguous things like E numbers. Mix all the ingredients together well and top your casserole before baking. The measurements are only approximate and can be adjusted to your own taste. Sometimes it’s nice to also blend in some dried herbs into the mix that compliment your dish ie: if the casserole is fish based a bit of dill mixed through is a nice touch! I’d love to hear from you either way. And enjoy your weekend! 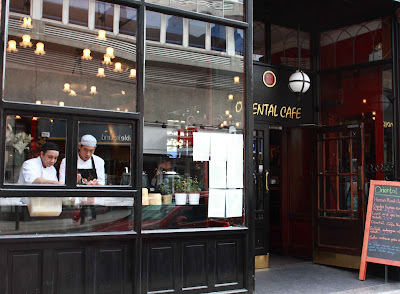 The time has come to talk about one of my old favourite restaurant venues in Dublin. I love Asian food (mainly Japanese, Thai and Korean) but Korean is on top lately. Since their opening I have frequented Ukiyo Bar on Exchequer Street. The prices have never been too steep and I could always navigate my way around the menu to get something Dairy Free at least, but as all things come and go in my life I hadn’t actually darkened Ukiyo’s doors for quite some time so you can imagine my nostalgic glee when my sister suggested Ukiyo as our lunch venue last Sunday in between two plays from the Ulster Bank Theatre Festival! 1st: The lunch menu on the weekends is heavily Mexican in feel and does not contain the food allergic options of the evening menu, with exception of the Caterpillar Sushi Roll which can be Vegan on request. However, the restaurant was quiet and our server was extremely lovely and managed to get us a meal from the dinner menu (thank you, thank you). 2nd: Although the menu states some dishes to be Vegan and/or Coeliac friendly Ukiyo request you to notify the staff if you are Coeliac so they can substitute any soya sauce with its Gluten Free partner Tamari. 3rd: Even though the menu only asks you to notify re: Coeliac and Gluten Free needs, I think that it is pretty clear that they need notification of Vegan too as some of the items clearly state egg, etc. as ingredients which can easily be left out. 4th, and most important (and heartbreaking): The dessert menu had two loudly labelled ‘Dairy Free’ desserts of Ginger Chocolate Ganache and Orange Chocolate Ganache both from Natasha’s living food range which means that they are also vegan, raw, gluten free and free from refined sugar! (€6.50). My sister and I were oh so excited to be having such a lovely meal and to be presented with the option of Dairy Free desserts that we decided to split a Ginger Chocolate Ganache. This is where our experience dampened... The second server, who was really really nice, and beautiful, was sadly not very fluent in English and although we ordered the ‘Dairy Free Ginger Ganache’ we were presented with the Ganache on a plate adorned with ice cream and syrups. We tried to ask if the side was Dairy Free as well but we were only told that it was a decoration (which we found somewhat funny). We opted to eat what we could and leave and touching parts in case the dessert was not actually fully dairy free as listed. When our table was cleared both servers commented on our left ice cream so we tried again with the second server who said that, no, it was indeed dairy-FILLED...! This is one of the most frustrating of allergy free events. Yes, the dish is originally Dairy Free or Allergy Friendly but the staff don’t fully understand why.. or forget.. or can’t answer our questions... anyway. We made the right decision by surgically removing the contaminated pieces and very thoroughly enjoyed the remainder - seriously! It was truly DELICIOUS! But the moral of the story is yet again, that you can NEVER ask too many questions.. and if in doubt ask to speak to another server, or the owner, or the chef.... but always remember to be polite and friendly because our server did want to understand, she just couldn’t... and food allergies are not the norm, and even though someone seems to be in the know, they frequently aren’t and it is your health and well being so you are in charge of looking after it. And if you go to Ukiyo, remember to make your dietary needs clear and if you order the ganache, ask for it to arrive without decoration! Because it truly is worth it. my sister would like me to recommend her other house favourite of Chap Che (marinated sweet potato noodle pan fried with vegetables and rice) which can also be made Vegan, but not Gluten Free. In addition to that which is labelled, simple dairy allergies or egg only allergies can be easily avoided with some sensible caution and questioning from remaining items on the menu. Do Venture, but venture with caution, always! Anyway, It’s that time again to bring the new month in (Happy October!) and take a little look back at all of our food allergy friendly finds over the past month. September 14th: A Super Easy & Super Healthy Snack: Kale Chips!